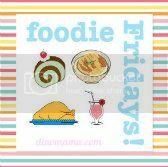 Foodie Fridays - Oh we so love Cod Fish! Cod fish has been our favourie fish since the day DinoBoy was able to eat solid food which was added to his porridge. The reason for choosing cod fish above other fishes because it does not have small tiny bones in the flesh so there is no danger of him swallowing it while enjoying his bowl of porridge. The fish is rich with Omega 3 fatty acids that is good for brain and eye development in infants. This fish does not come cheap over here, a small fillet will cost close to $10 as you can see from the photo below. The most known health benefit of cod is that it is an excellent source of protein, while being low on calories at the same time. It also contains a variety of other essential nutrients. Studies have proved cod to be very useful for people suffering from atherosclerosis and diabetic heart disease. People, who eat cod fish regularly, are at a much lower risk of suffering from heart diseases and heart attack. More specifically, cod fosters cardiovascular health, as the omega-3 fatty acids contained in it are a good source of blood thinning. Cod is also a rich source of Vitamin B12 and B6. Both the vitamins are beneficial in keeping the homocysteine levels low in the body. Homocysteine is a molecule which is capable of damaging the walls of blood vessels in the body. High levels of homocysteine increases the risk of heart attacks and strokes. Cod is known to bring down the cholesterol levels, because it contains Niacin, which is another B vitamin. This vitamin plays a significant role in controlling the cholesterol levels in the body. The risk of arrhythmia and/or sudden death is significantly reduced by consuming the Omega 3 fatty acids, EPA and DHA, both of which are present in cod liver oil. Studies have also put forward strong claims to establish that the omega 3 fatty acids present in cod can effectively treat depression. Continued consumption of cod liver oil can greatly help in mood swings associated with bipolar disorder. Sufferers of bipolar disorder, who struggle to control their moods, are suggested to consume cod liver oil. A regular dose of cod liver oil helps fight rickets in children, which is a bone softening condition. It also prevents ear infections in children. It has been witnessed that babies of mothers who regularly consume cod liver oil are less prone to type-1 diabetes. Omega 3 fatty acids contained in cod can interfere with the ability of blood to clot, which increases the risk of hemorrhagic strokes. While cod makes for a low cal food, cod liver oil is high on calories and therefore, its consumption needs to be moderate and well regulated. Large amount of cod consumption can prove dangerous for other reasons as well. As it is very rich in many vitamins, over-consumption can be risky. You probably noticed from the meals I shared over the years, cod fish makes its presence onto our dining table fairly often in steamed style with a dash of steam fish sauce (蒸鱼酱青). The subtle sweetness and oily flaky flesh requires no additional marinate to enhance it's taste. Besides that I have pan fried and baked this fish by adding butter, lemon and some herbs. I usually buy my packet of frozen cod fish from the neighbourhood supermarket and cost between $18 - $22+ for either a big round piece or 3-4 small pieces, pricey but no choice since we love it so much. 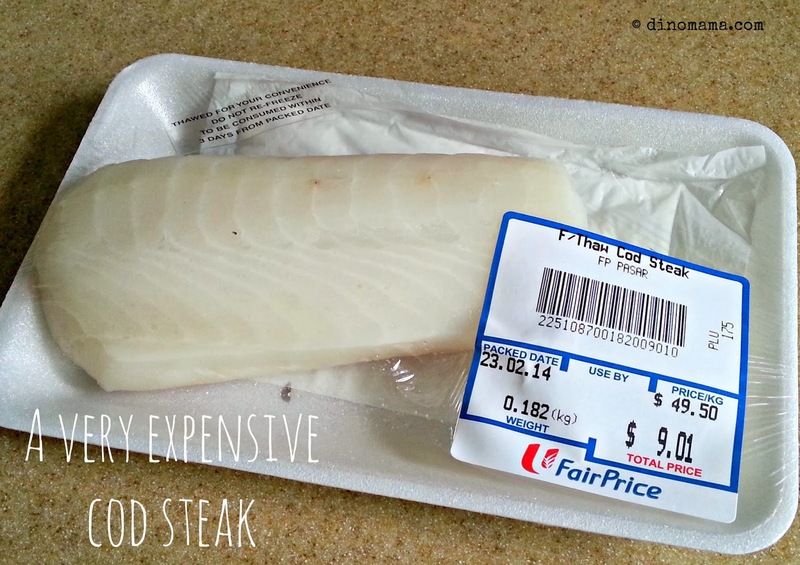 Recently I had a craving for cod fish porridge so last weekend I bought a freshly thawed cod fish steak from the supermarket @ $9.01 to share with DinoBoy. I cooked the porridge first in my rice cook. I rampaged my fridge and found carrot and cabbage so I washed, cut and boil them in a pot before adding them into the rice cooker. I added in the cod fish into the pot and let it cook for 5mins. When I open up my rice cooker, the fish is done nicely and the porridge has a layer of oil on it. 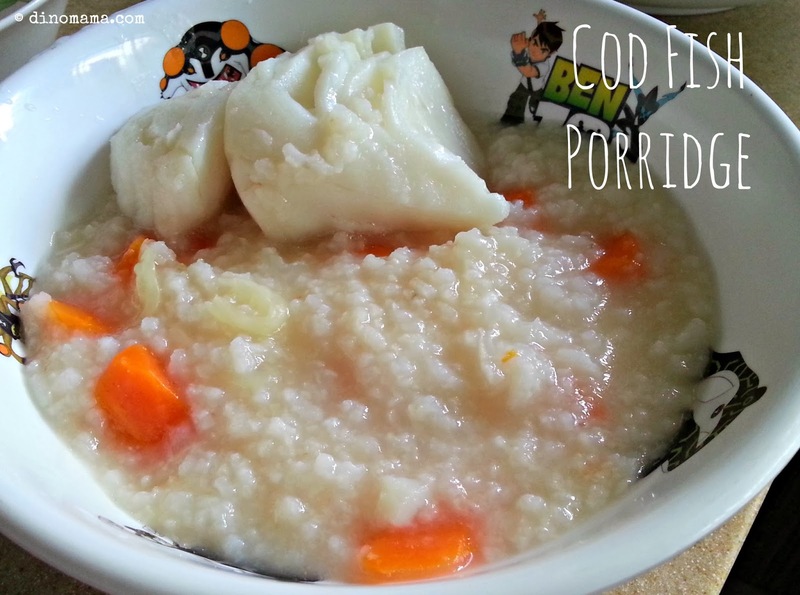 I removed the cod fish from the porridge to remove the bones by using a tweezer, divide the fish unequally (more for him and lesser for me hehehe~), add in the porridge and we enjoyed a simply but nonetheless healthy porridge.